Learn how to better communicate with a person with Alzheimer’s disease. Alzheimer’s disease and other types of dementia have a strong influence on language. The disease has an effect on speech and making use of words, as well as the comprehension of words. As the disease advances, language as a method of connecting will become less effective, and family and friends may need to choose different methods for communicating to interact with their loved one. Make sure to use a kind tone – slower, lower, smiling. Always treat the individual as an adult with the utmost respect, and make your best effort to be patient, flexible, supportive and calm. Be sure there are reduced distractions from things like the television or radio, and maintain eye contact. To orient the individual and get his or her attention, call the senior by name and tell the person who you are, even if you are the spouse or child. Be sure not to debate or try to change the person’s mind, even if you are convinced the senior’s request is illogical. Repeat information and questions. If the senior doesn’t react, wait a minute for him or her to understand the request. Then ask again. Concentrate on the feelings, not the facts, as oftentimes the emotions being conveyed are more important than what is being said. Let the individual carefully consider and describe whatever he or she wants. If the senior chooses the wrong word or cannot think of a word, try guessing the right one. If you still can’t comprehend what is being said, ask the person to point or gesture. Caregivers at Hired Hands Homecare, the area’s number one provider of the elderly care Santa Rosa families trust, are highly skilled in sensitive Alzheimer’s and dementia care. Our caregivers know how to gently encourage and mentally stimulate a senior with dementia, keeping him or her safe in the comfort of home. 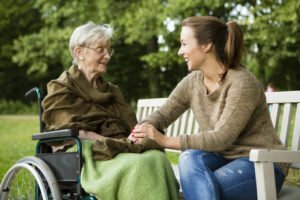 Not only can we provide respite care to allow family caregivers a necessary break from care, but we can also coordinate community services as needed, such as adult day centers for Alzheimer’s, overnight care to help with some of the more difficult effects of the disease (such as sundowning), and so much more. Contact us today at (866) 940-4343 to learn more or to request a free in-home consultation. The perfect way to communicate with a person having dementia is to do so during times of lesser distractions in the surroundings. This advice serves to aid them in concentrating on your conversation and comprehending it in a better way without getting confused or anxious.